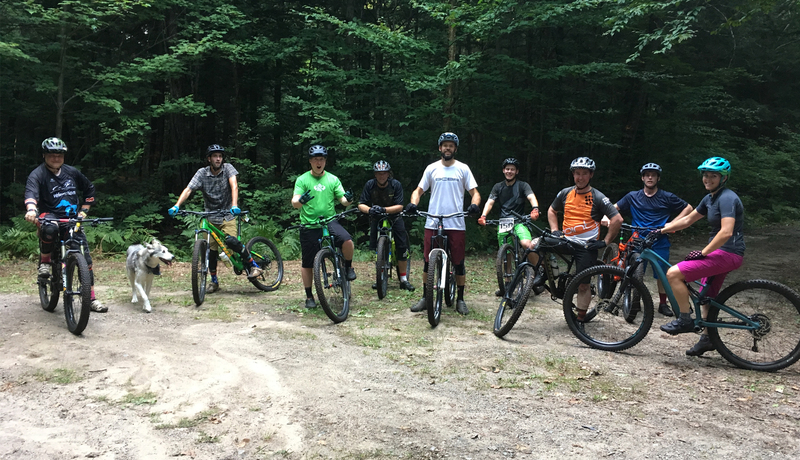 Writer and rider Bill Farnsworth hit the trails with the Muskoka Off Road Cycling Association (MORCA), a new cycling group in cottage country. Established by a team of experienced riders, their mission is to create and maintain new trails and to promote a positive cycling culture in the region. Although it’s only their first official season, they’ve already started building trails that promise to challenge and reward all skill levels. Thanks to the folks at MORCA, you’ll find the best undiscovered trails in the region at the Bracebridge Resource Management Centre. Located just north of the town of Bracebridge, the centre has long been used by Nordic skiers and hikers. 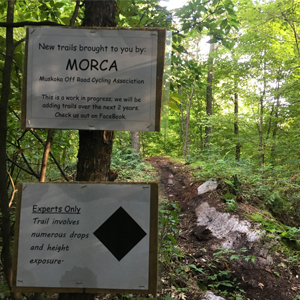 Previously home to some double track paths for cycling, this spring MORCA began flagging and creating singletrack trails running between these established routes. After learning that they host a group ride every Monday night, I quickly made plans to experience these new trails for myself. I arrived at the recently reopened parking lot (just off of Hwy 11 on Holiday Park Rd) in the middle of an epic downpour of rain. Secretly hoping that the ride would be called off, I was surprised to discover a group of 6 riders gearing up to head out. I was greeted by MORCA president Roy Davies and Vice-President and trails coordinator Scott Wilson who invited me to suit up as well. Not one to back down from a challenge, I readied myself to ride. As I swung my leg over the bike, Roy casually asked about my level of technical riding skill. I naively mumbled that I can hold my own as we set off onto the trails. Straight out of the parking lot I encountered a section of trail that had been raised above a wetland section, complete with a long wooden bridge. After the ride, Roy told me that this single section had taken over 200 hours of labour to complete, but was essential to reach the new system of singletrack they were creating. After that it was a twisting climb to reach the entrance to one of the new trails, named “Crazy Goat.” The trail head was well signed, with the words “Experts Only” and a warning about numerous drops and height exposure. With words of encouragement to rally us against the rain pouring down from above, we were off, mud flying from the tire lugs. For the next 15 minutes I took turns trying to navigate tight corners and a seemingly endless number of exposed rock faces to climb and descend. There were steep rollers and white-knuckle drops interspersed with rock gardens and obstacles to traverse. With the rain in my eyes the trail was a blur of features to be attempted (and often simply walked.) Every obstacle I managed to clear sent a wave of accomplishment through my tired legs. The group always waited so that no one was left behind. Around me I could hear shouts of both encouragement and defeat, but at every junction I saw only fun and enthusiasm reflected on muddy faces. Before returning to the parking lot on a trail aptly named “The Freeway,” I rode one of the most memorable sections of trail in my 30 plus years of cycling. One particularly steep and fast descent had so much water rushing down it that I felt as though I was white water rafting instead of biking, the water obscuring the ground ahead and spraying in waves around my tires. Back at our vehicles, everyone swapped stories of triumph, near misses and the ones that got away. I was assured that if I came back next week, the trails would be drier and easier to navigate, plus I would get to ride the infamous trail dubbed “Gnarnia.” That was enough for me to mark it on my calendar. 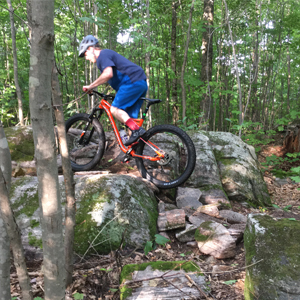 It took about a year and a half for the Muskoka Off-Road Cycling Association to get off the ground and get permission to actually start building trails. Throughout the process, the Town of Bracebridge was keen to encourage cycle tourism and support more outlets for existing cyclists to enjoy. 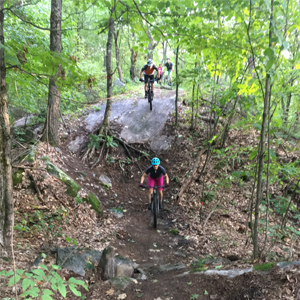 The group is focused on building trails with an emphasis on both fun and longevity. They take the time to construct the trails properly so that they can be enjoyed for years to come. A core of dedicated volunteers has literally put sweat and blood into creating what they feel are some extremely unique and challenging trails. 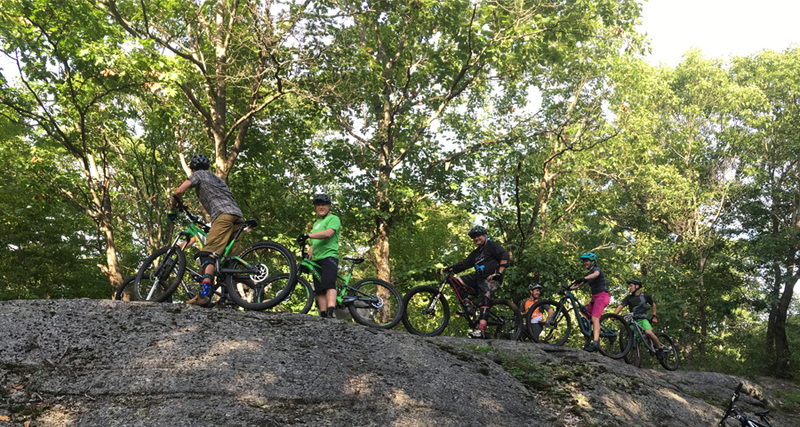 With plans to build a mixture of difficulty levels into the trails, the group hopes that this site (MORCA calls it the Resource Centre Mountain Bike Park) will become a well used popular mountain biking destination. I returned the following Monday night under bright skies and hot, humid conditions. The group was almost a dozen riders including Aleesha, owner of Parry Sound Bikes. We set out to discover that the trails were much drier, but still extremely challenging. Riding with a group encourages riders to push their limits and build their skills while benefiting from the knowledge and encouragement of more seasoned cyclists. Watching those with more experience on the trails allowed me to find better lines and learn a few tricks, which allowed me to successfully clear many more tricky features than the previous week. For an hour and a half our group grunted and grinded our way through the woods on trails with names such as “Winter’s Coming”, “Jake Brake” and, as promised, the infamous “Gnarnia”. While the sun made patches of shadow through the leaves, MORCA’s official mascot Stanley the trail dog could be heard jingling up and over obstacles that bikes had difficulty clearing. True to their mandate to build trails for all cycling levels, we also rode a pair of fast and flowing trails suitably fun and exciting for riders of all abilities. Back in the parking lot, as I wiped away blood and dirt from an unexpected trip over my handlebars, I got caught up in the sense of camaraderie and pride that the group shares around this burgeoning trail system. I realized that despite my wobbly legs and still burning lungs, I couldn’t wait to come back. The group is hosting a trail building day on Saturday, September 15. 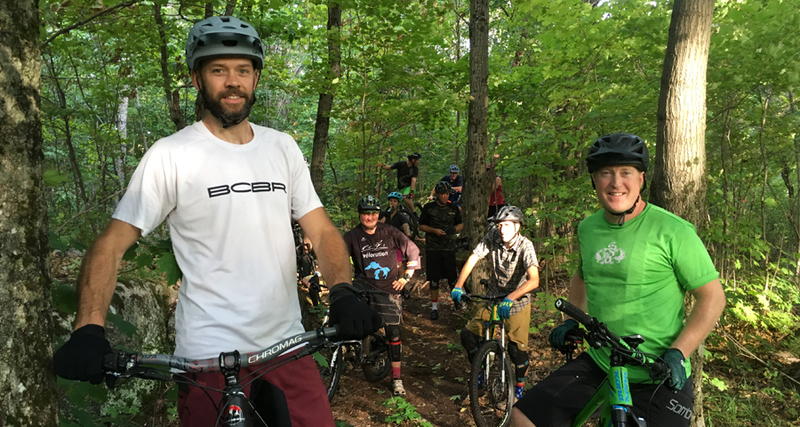 All are welcome to join them and the day will be followed by a barbecue and beverages sponsored by Gravenhurst’s Sawdust City Brewing Co. Be sure to head to Bracebridge to experience these exciting and challenging new singletrack trails for yourself. The trails are all mapped here on the Trailforks website and app. MORCA hosts a group ride every Monday night. Check their Facebook page for details on upcoming rides.